North Carolina resident Tammy Kaufman recently visited Medoc Mountain State Park in search of inspiration for her latest painting. 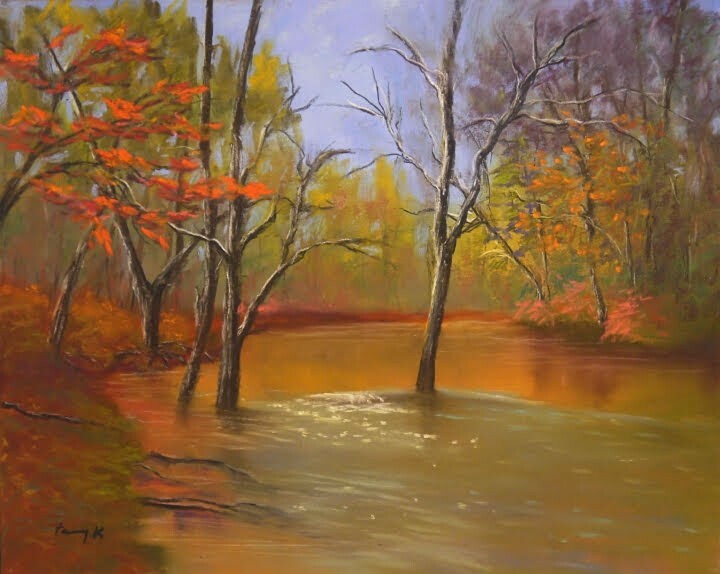 Ms. Kaufman creates original pastel landscape paintings from her experiences in nature and was not disappointed in the natural beauty the park offered. After finding her place along the Stream Loop Trail, she snapped a few photos and created a unique piece of art. When her painting was completed, Ms. Kaufmann reached out to the park to express her gratitude to the ranger who assisted her and to share her work of art. She agreed to display the painting, along with several other works of art she has created, in our Visitor Center. Ms.. Kaufman’s artwork has been displayed in collections throughout the United States and the park is honored to display pieces from her collection for our visitors to enjoy. The paintings are on loan and will only be available to view for a short time. The Visitor Center is open every day from 8 a.m. – 5p.m.